The commentary was done by Nakita and his BFF Dieter. It was Daimler-Benz’s first rear-engined civilian car and first attempt to enter the economy car market. The 130H (Heckmotor, Rear Engine) was powered by a rear-mounted, water-cooled 1,2 L flat four engine that produced 18 kW (25 hp). It was available in cabriolet and saloon body styles. Despite the low cost of 3,425 Reichsmarks (about $22,300 NZD in 2015 dollars), the production ended in 1936 due to poor sales and safety concerns. Since the heavy engine was mounted at the tail of the backbone chassis, the 130H suffered poor weight distribution that led to poor handling. The 130H was far superior to all its European competitors at the time. One of them was restored and can be seen on display at the Mercedes-Benz Museum in Stuttgart-Bad Cannstatt, Stuttgart, Baden-Württemberg, Germany. Fun fact: A Jewish engineer named Josef Ganz helped develop the 130H and other rear-engined civilian cars. There is so much controversy surrounding him. Some people believe that he was the real father of the Volkswagen Typ 1 (Käfer, Beetle). Spoiler alert: Nope, he wasn’t. “The world thought this was a drawing of the Volkswagen Typ 1,” Nakita said and rolled his eyes. “I think this is the cutest Mercedes-Benz,” Dieter commented. The G4 (Geländewagen, All-Terrain Car) was an off-roader used by top Wehrmacht (Defence Forces) officials before and during the Second World War. It was powered by a front-mounted, water-cooled 5 L straight-eight engine that produced 75 kW (100 hp). Halfway through its production, the engine was enlarged from 5 L to 5,2 L and 5,4 L and produced 85 kW (115 hp) and 80 kW (110 hp). The power was transferred through an unsynchronised four-speed manual transmission to the rear wheels or, optionally, all six (6x6). In order to avoid wearing out the heavy-tread tyres, the G4 was mechnically limited to 65 km/h (40 mph). Many German car enthusiasts didn’t know it existed until they saw Hitler riding in one during the annexation of Austria in March 1938 (not pictured). Only 57 examples were produced, and one of them was restored and can be seen on display at the Mercedes-Benz Museum. Fun fact: The G4 was evolved into the Mercedes-Benz G63 AMG 6x6, which has been in limited production since 2013. You can buy one today for just €450,000 (about $740,000 NZD). “Most 6-wheel cars look stupid. This is how it’s done,” Nakita commented. “It looks like a (Mercedes-Benz) 770 cabriolet with two more wheels,” Dieter said in awe. When Hitler went into power, many things in the German automotive industry took a turn for the better. He encouraged German automakers to experiment with the use of alternative fuel (diesel). The 260 D was one of the world’s first diesel-powered passenger cars. It was powered by a front-mounted, water-cooled 2,5 L straight-four diesel engine that produced 33 kW (45 hp). Although the engine produced a lot of vibrations. It had fuel economy of 9 L/100 km (26 mpg), which is very impressive at the time. The 260 D was produced along with its petrol-powered twin, Mercedes-Benz 260 (W11). They were available in cabriolet, landaulette, roadster and saloon body styles. The 260 D’s diesel technology was largely overlooked because the car had a dark history. The saloon model was very popular among the Geheime Staatspolizei (Secret State Police, or Gestapo) and the Schutzstaffel (Protection Squadron, or SS). Whenever people heard the tyres of a black 260 D screeching to a halt, trouble was to be expected. One of them was restored and can be seen at the Mercedes-Benz Museum. There is a black 260 D Pullman (saloon) in the garage at my great grandparents’ villa in Germany. My great grandfather bought it new as a personal car in 1937. It was recently professionally restored to original condition. “My grandfather took us for a spin in my great great grandfather’s 260 D. It was slow, but I loved it!” Nakita said. “Me too, but I hated the vibrations. I think I lost a tooth or two,” Dieter said. The aluminium-bodied 710 SSKL (Super Sport Kurz Leichtbau, Super Sport Short Lightweight) Rennsport (Race Car) was powered by a front-mounted, water-cooled, supercharged 7,1 L straight-six engine that produced 225 kW (300 hp). It could reach speeds as fast as 235 km/h (145 mph). The 710 SSKL and its predecessors, 710 S, 710 SS and 710 SSK, were designed and developed by the real father of the Volkswagen Typ 1, Dr. Ing. h.c. Ferdinand Porsche. Only two examples were produced, and one of them can be seen on display at the Mercedes-Benz Museum. Fun fact: Rudolf Caracciola was the first race driver to win the first Grand Prix race on the newly opened Nürburgring Nordschleife track on 19 Juni 1927. The car he drove was a 710 S.
“What about the 710 SSK Trossi (Roadster)?” Dieter asked curiously. “It’s a Mercedes-Benz with a non-Mercedes-Benz body,” Nakita answered. “A perfectly good race car ruined by Willie White, a coachbuilder that no one had heard of,” I answered. It was essentially a stripped down and militarised version of the Mercedes-Benz 320 luxury car. The 320 WK (Wehrmachtkübelwagen, literally Bucket Seat Car of the Defence Force) was powered by a front-mounted, water-cooled 3,2 L straight-six engine that produced 57 kW (75 hp). Only 90 examples were produced before the Second World War broke out in September 1939. Although it was criticised due to high production costs and poor off-road capability, it remained in service during the war. When Dr. Ing. h.c. F. Porsche GmbH was developing the Typ 82 Kübelwagen, it was so successful that the firm was ordered to put it into mass production in February 1940. The Typ 82 ultimately replaced all other LUVs (light utility vehicles). One of them can be seen on display at the Mercedes-Benz Museum. “I love how those 1970s muscle car-like wheels look on this,” Nakita commented. “It’s better looking than the boxy Typ 82,” Dieter commented. In 1937, the NSKK (Nationalsozialistisches Kraftfahrkorps, National Socialist Motor Corps), a German state-sponsored motor club, announced that there would be an endurance race between Berlin, Germany, and Rome, Italy. Porsche saw a great propaganda opportunity and built this stunning one-off. The Typ 64 was essentially a stripped down Porsche Typ 60 VW38, a prototype that would one day be known as the Volkswagen Typ 1, with a lightweight, streamlined body and a different engine. The body, which had fully enclosed wheels and a full belly pan, was made of precipitation-hardening Duraluminium alloy and it was only 0,5 mm (~1/48 in) thick. That is the thickness of five sheets of printing paper! Thanks to the weight reduction, the Typ 64 weighed only a mere 550 kg (1,215 lb). The rear-mounted, air-cooled flat four engine was enlarged from 985 cc to 1,13 L and produced 24 kW (32 hp). With a top speed of 140 km/h (90 mph), it easily qualified for the Berlin-Rome endurance race. Unfortunately, the race never happened due to the outbreak of the Second World War. Porsche eventually built a second car during the war. There is only one surviving example, and it was restored and can be seen on display at the Porsche Museum in Stuttgart-Zuffenhausen, Stuttgart, Baden-Württemberg, Germany. Fun Sad fact: A United States Army unit found one of the two Typ 64’s hidden away near the Porsche family villa in Zell am See, Salzburg, Austria. They tried and failed to turn it into a cabriolet by cutting a hole in the roof. The Typ 64 was driven recklessly until the engine gave away due to negligence. Instead of checking the engine, the soldiers junked it. “No respect!” Nakita said, scowling. “Thanks, Obama! Er, I mean, Truman!” I said, scowling. It was produced specially for the newly constructed high-speed Reichsautobahn (Motorway of the German Empire). The 540K Autobahn-Kurierwagen (Motorway Courier Car) was essentially a Mercedes-Benz 540K cabriolet A with a streamlined coupe body. Unlike the 540K cabriolet A, it could seat four. The 540K Autobahn-Kurierwagen was powered by a front-mounted, water-cooled, supercharged 5,4 L straight-eight engine that produced 135 kW (180 hp). The aerodynamics improved the car’s speed and handling. Only two examples were produced, and one of them was restored and can be seen on display at the Mercedes-Benz Museum. “Two 540K Autobahn-Kurierwagens and four 500K Autobahn-Kurierwagens all went to the Middle East,” Nakita said and sighed. “All oil comes from the Middle East. Oil is black gold, hence the paint,” my husband said. “It is the evilest looking car at the Mercedes-Benz Museum,” Dieter said. The world’s most beautiful and advanced motorcycle that never was. The fully enclosed streamlined body was BMW’s response to the growing Art Deco movement and the new Reichsautobahn. The bodywork was mounted on a pressed-steel frame and had telescopic forks. The R7 had fenders that partially wrapped around the wheels. The air-cooled 800 cc flat twin engine, which produced 25 kW (35 hp), was covered with streamlined sheet steel that incorporated with the body. Interestingly, the cylinders and cylinder heads were a single unit and the crankshaft was a single unit as well for improved strength. There was a glove compartment under the fuel tank and seat. On top of all this, the R7 had a car-like four-speed gear lever just right of the fuel tank. Sadly, the R7 had so many new innovations that BMW couldn’t afford to put it into production, forcing the company to abandon the project. Instead of taking the R7 to the 1934 Berlin IAMA (Internationale Automobil- und Motorradausstellung, International Automobile and Motorcycle Exhibition), BMW put it in a wooden crate and buried it in an undisclosed location. The R7 was unearthed in 2005. It was badly damaged from mould and rust. Battery acid dissolved a good sized chunk of the motorcycle. BMW paid BMW Classic a fortune to have the R7 restored to original condition. It lost its originality, because many parts were redeveloped and remanufactured. Thr R7 can be seen on display at the BMW Museum in Olympiapark, Munich, Bavaria, Germany. “I was an arm’s length away from my favourite motorcycle in the world at the BMW Museum,” Nakita said with a smug smile. In 1933, the NSDAP (Nationalsozialistische Deutsche Arbeiterpartei, National Socialist German Workers’ Party) demanded German automakers to produce small economy cars that every working German could afford. Porsche, a small automotive design and engineering firm of only eleven people, took a stab at the competition in 1934. Hitler, who was fascinated by Dr. Porsche’s race cars for Benz & Cie. Daimler-Benz and Auto Union, eventually got involved and ordered German automakers to stop developing, producing and selling economy cars by 1936. Despite the low monthly grants, limited access to tools and materials, poor working environment and skepticism from the Reichsverband der Automobilindustrie (Association of the Automotive Industry of the German Empire), an organisation that gave Porsche the grants, Porsche managed to produce 6 prototypes without any extra help. Satisfied with the prototypes, the DAF (Deutsche Arbeitsfront, German Labour Front), a state-funded organisation, took over the development and established a joint venture between Porsche, Daimler-Benz and Stuttgarter Karosseriewerk Reutter & Co. GmbH to produce fleets of prototypes for testing and promotional purposes. Daimler-Benz produced the chassis, Reutter produced the bodies and Porsche put them together and distributed them. The Typ 60 VW38 was the 7th prototype and there were 27 examples of it. Like its predecessor and successor, Porsche Typ 60 VW30 (30 examples) and Porsche Typ 60 VW39 (17 examples), the Typ 60 VW38 was powered by a rear-mounted, air-cooled 985 cc flat four engine that produced 17,5 kW (23,5 hp). There were three models of the Typ 60 VW38: a saloon, a saloon with a roll-back sunroof and a cabriolet. It eventually went into production as the KdF-Wagen (Kraft durch Freude Wagen, Strength through Joy Car) in 1941. In 1946, after the end of the Second World War, the production resumed, but the car was renamed Volkswagen Typ 1. Out of all Volkswagen prototypes, only two Typ 60 VW38’s and one Typ 60 VW39 survived the war. One of the Typ 60 VW38’s and the Typ 60 VW39 were restored and can be seen on display at the Autostadt in Wolfsburg, Landes Niedersachsen, Germany. The other Typ 60 VW38’s is in the private collection of Christian Grundmann. Go here to read about the development history of the Volkswagen Typ 1. Fun fact: There are 1947 and 1951 Volkswagen Typ 1s in our garage. The former is a black saloon and it belonged to my great grandfather. He bought it new at the newly rebuilt Volkswagen plant in 1947. It was professionally restored to original condition and imported here from Germanyy. The latter is a saloon, and we are slowly restoring it. “We’re going to drive the 1947 Typ 1 to my grandparents’ house for dinner tonight,” Nakita said proudly. “They’re not the same anymore,” Nakita agreed. The most beautiful Mercedes-Benz of all time. It was powered by a front-mounted, water-cooled 7,7 L straight-eight engine that produced 110 kW (150 hp) without supercharger or 150 kW (200 hp) with. The 770 could reach speeds as fast as 160 km/h (100 mph). The most famous owner of the 770 was no one other than Adolf Hitler himself. His dark blue supercharged 770 cabriolet (W07) was designed and built specifically for him. It was equipped with seat heaters, foldable front passenger seat, so Hitler could stand up and salute, and gun compartments. It was armoured with 1,8 cm (0,75 in) thick steel panels and 4 cm (1,5 in) thick windscreen. Despite the armoury, the roof was made of canvas and the side windows were normal windows. The roof and side windows were folded down and rolled down most of the time, exposing the passengers. 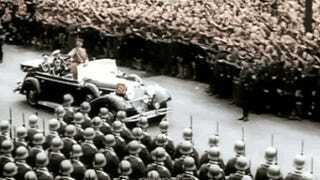 Hitler’s 770 cabriolet weighted a whopping 4,800 kg (10,580 lb). Due to the weight, it could cruise at 130 km/h (80 mph). It was restored and can be seen on display at the Canadian War Museum in Ottawa, Ontario, Canada. My great grandfather’s garage happens to be home to two black supercharged 770s—a 1931 cabriolet (W07) and a 1940 Pullman (W150). He bought them new. They were professionally restored to original condition. “The most beautiful car of all time,” Nakita corrected, grinning. “I second that,” Dieter agreed. Nakita asked me to add one more car that is not from the 1930s as a honourable mention. The G63 is powered by a front-mounted, water-cooled, twin-turbocharged 5,5 L V8 engine that produces 420 kW (565 hp). The power is transferred through a 7-speed automatic transmission to the front, rear or all four wheels. Despite its boxy 35 year old body design, it is packed with a lot of technology. Heaters and fans to keep the leather seats warm or cool, many sensors, computers and warning systems, automatic transmission that lets you change gears manually using paddle shifters, you name it. The best part is the suspension. With proper tyre pressure, driving on the Autobahn at 200 km/h (125 mph) feels like driving a cloud. Believe it or not, it can actually go off-roading—with appropriate tyres, of course, not the equipped sport ones—and tow heavy loads. The G63 is essentially a gold-plated Tiger II tank. We have a black one just like the one pictured in Germany. It is over 18,000 km (11,000 mi) away as we speak. Hoo boy do we miss it. We have a black 2015 Mercedes-Benz GL500 (X166) here. The hatch doesn’t open like the G63. I am 162 cm (5,3 ft) tall and I feel like a football mum every time I try to reach the hatch to close it. “Dad? Dieter and I are starting football next weekend,” Nakita said sheepishly. “Oh brilliant. Just brilliant. Now I feel like a real football mum,” I said.